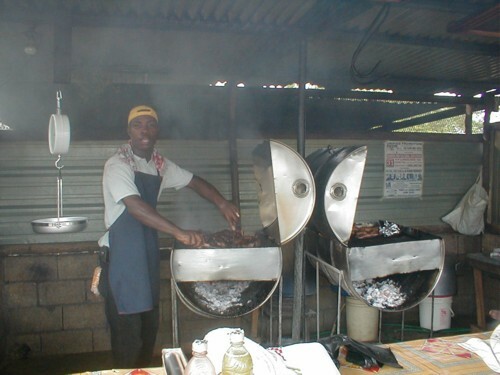 Driving along the winding roads of Jamaica, the tantalizing aromas of grilling chicken, pork and fish permeate the air. Dotting the roadsides are makeshift cook shops and sheds, all fronted by homemade grills converted from metal drums. On Fridays and Saturdays especially, the vendors are swamped as they try to meet orders being shouted by customers. Hand-lettered signs, promote “jerk” chicken, pork and fish. Jerking is a centuries-old method of preserving meat, especially wild boar, once plentiful in the hills of this Caribbean isle. You can expect to see signs advertising “Authentic Boston Jerk Centre” in the capital city of Kingston, but the real Boston jerk is found in Boston Beach, on the northeastern end of the island. Boston Beach is synonymous with jerk, and to the true connoisseur, the majority of Kingston sidewalk vendors are “pan chicken men” offering to the unsuspecting a watered down version of the real thing. 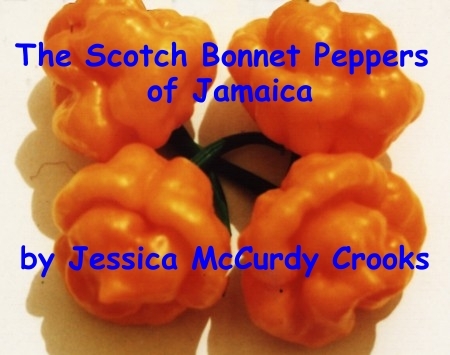 Be warned, however: The sauce they serve is just as fiery, utilizing the hottest of hot chiles â€“ the Scotch Bonnet pepper. Jerked meat is a popular item on many menus, not just in Jamaica, but in the Caribbean, North America and even in Europe, especially England. The technique is used with the traditional pork and chicken, but also shrimp, tofu and just about anything you can think of. If you cannot tolerate hot and spicy food, do not attempt to eat Jamaican jerk. For it to be real jerk, it has to be hot. 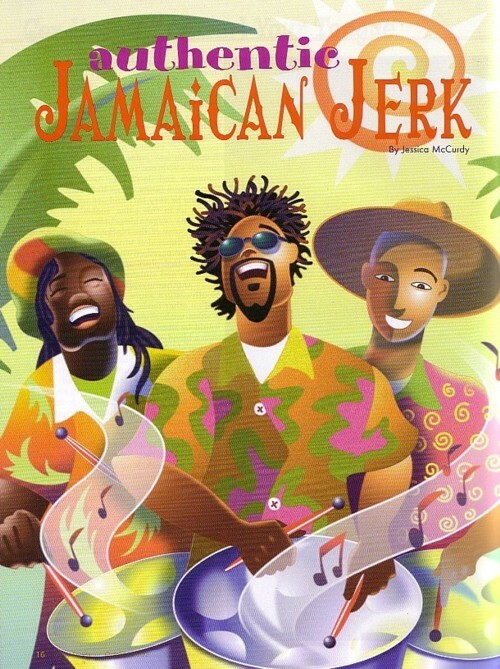 Historians believe that the history of jerk can be traced back to the Carib and Arawak Indians who inhabited the Caribbean islands before the arrival of Spanish explorers in the fifteenth century. The Amerindians slow-cooked their meat with citrus and spices in order to preserve it. Most Jamaicans now believe that the technique was perfected by the Maroons, former slaves from brought to Jamaica from West Africa, where they had used a process of cooking and preserving meat by heavily seasoning it with peppers and slow cooking over smoke. The escaped or freed slaves settled in the islands hills, where the terrain made it easy for them to elude capture. 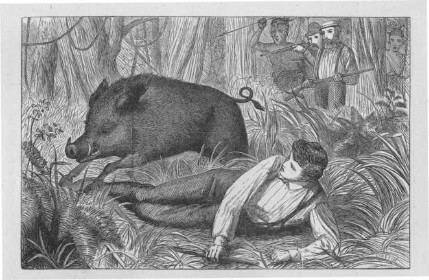 In the hills, the Maroons hunted wild boar. The boar was stuffed with a mixture of peppers and herbs, wrapped in banana leaves and placed it in a pit prepared with hot stones and slow burning wood from pimento trees. The hole was then covered with leaves and palm fronds. This process took hours, but the result was succulent and juicy. 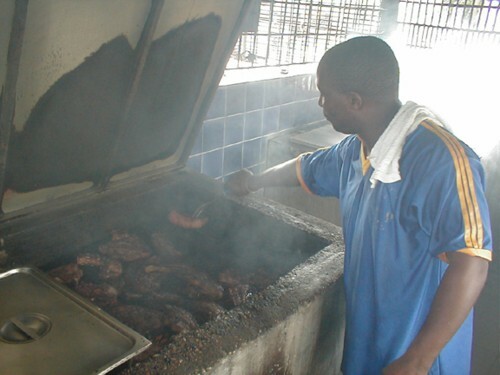 Today, the term jerk refers both to the method of cooking and the seasoning used to marinate meat before cooking. 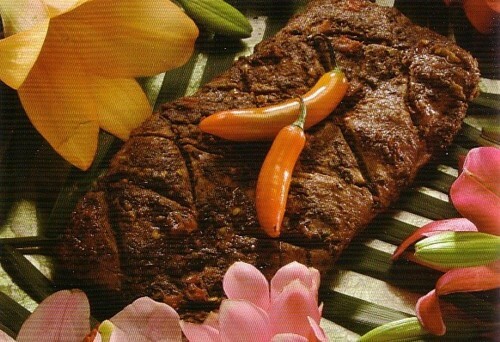 There are many variations in the preparation of jerk, but they all depend on one basic ingredient: the jerk seasoning. The seasoning can be homemade or store-bought, a dry rub or a wet paste. For best results, the meat is scored and the seasoning rubbed in. It is then covered and left to marinate for a few hours, ideally overnight. The seasoning/paste is made from pimento (known as allspice), Scotch Bonnet or habaneros, scallions, onions, thyme leaves, black pepper, cinnamon, nutmeg and salt, although taste varies and additional spices are added by different cooks. Some vendors state that they use up to twenty or more different ingredients. The more adventurous like to add a dash of rum when jerking pork. Once the meat has been marinated for the desired length of time, the cooking begins. The best jerk is done by slow cooking over a low heat generated by slow burning green wood, preferably pimento. The wood use is important as it adds to the flavor. While pimento is the green wood of choice, other local trees such as guava and orange are used. 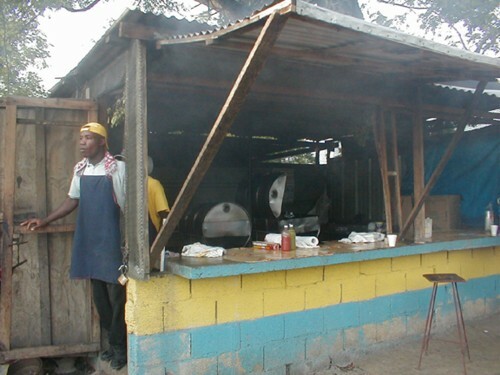 In the tourist capital of the island, Montego Bay, Jerky’s Bar and Grill and The Pork Pit are established places to savor Jamaican jerk, but the pan chicken man or jerk huts also offer different tastes of jerk. Jerky’s, one of my favorites, is only a few years old. They offer jerk chicken, pork and sausages; Make sure to ask for local side dishes of festival, bammy or better yet, hard dough bread. To wash down your jerk, try a cold Red Stripe beer, a natural fruit drink made from fruits in season, or an ice-cold glass of lemonade. In Kingston, ask anyone for great jerk pork and they’ll send you to Chelsea Jerk Centre situated on Chelsea Avenue, New Kingston. Of course if you want to spend a lazy day in, you can order from 925-JERK. This is an innovative concept in jerk that was started a few years ago in Kingston, and is slowly being copied in other parishes. Also foraging into the jerk craze is the fast food giant, Juici Patties. They have restaurants in most parishes. Most of the vendors operating at the Boston Jerk Centre, are second and third generation “jerk maestros.” While some of the vendors operating at Boston still use the traditional pimento wood, others have through experimentation found other indigenous green wood to add their own unique flavor to their offerings. In addition to pork and chicken, lobster, fish and even sausage can be had if you are lucky. To add even more fire to jerk is the dip that comes with it. The unwary have been known to be reduced to tears if they lavish too much of the sauce onto the mouth watering fare. Unless you are truly a pepper lover, try a sample first before asking that sauce be sprinkled onto your meal. Jamaicans love festivals, and there are a wide variety of food festivals in various parishes, the most popular of which is, you guessed it, The Portland Jerk Festival. This festival is held annually in July in Boston, Portland. You’ll be sure to find other delicious Jamaican staples on hand such as roasted breadfruit and yam. 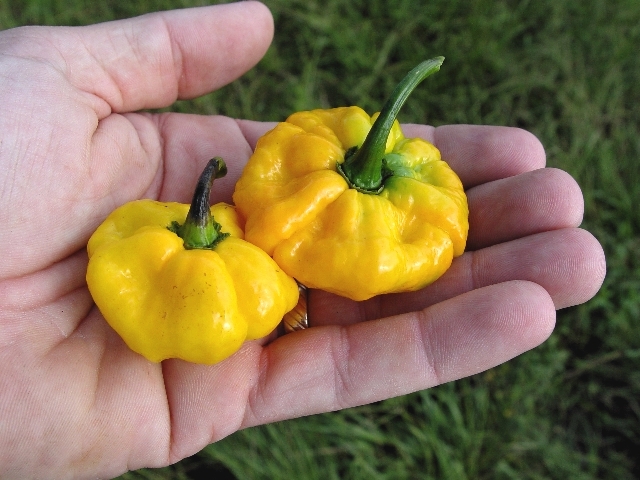 This fiery pepper is grown in Jamaica for both the export and domestic market. Its name is derived from the shape of the pepper, which resembles a Scottish tam. The Scotch Bonnet pepper is a relative of the habanero chile, and is said to be at least fifty times hotter than the mighty jalapeño. Grown in almost every parish, this pepper is normally in short supply as the demand for it is high. The pimento tree is used in rural areas as the wood of choice for cooking jerk. It is not endangered, and is farmed for export in some areas. The pimento tree is indigenous to the Caribbean, but the name was given by Spanish explorers who used their word for peppercorn. The berries of the pimento tree do resemble peppercorns, but outside of Jamaica they’re known as allspice. Related Article: A Brief History of Jerk Pork, here. Here is a typical Jamaican jerk rub that can be used on any meat or fish. Feel free to improvise and add ginger, bay leaves, and coriander if you like. In a food processor or blender, process all the ingredients together to make a paste. Store the paste in a glass jar in the refrigerator. Fiery foods aficionados will love this sauce that is often served over jerked meat. In a food processor or blender, process all ingredients until smooth. Serve over cooked meat. Extra sauce will keep for months in the refrigerator. 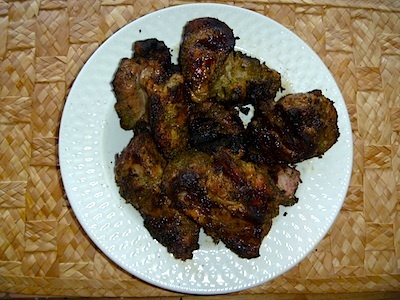 There are many variations to preparing traditional jerk pork. This is the method used by my mother. When asked why she seasoned the meat in addition to using the rub, she responded: “More flavor. Pork must be well seasoned.” How could I question her further since she claims to be descended from the Maroons? Of course, Mom was all for natural seasoning, so the soy sauce is my addition. Mom always maintained that pork must be cooked with ginger to avoid tummy aches. In a bowl, combine the onion, thyme, black pepper, allspice, vinegar, soy sauce, tomatoes and ginger. Cut pork tenderloins lengthwise, scoring the meat. Roll the pork in the mix, and then lavishly cover with jerk rub, ensuring that you stuff some inside the score marks. Put the seasoned meat in a resalable plastic container and refrigerate at least two hours. Prepare a charcoal grill, adding 2 cups of soaked chips from lemon, orange or pecan wood. Grill over low heat until the interior reaches 140 degrees to 145 degrees F, about 2 hours. This is my favorite way to cook chicken. In a bowl, combine the peppers, onion, thyme, black pepper, allspice and vinegar. Rub the mixture into the chicken pieces and marinate for at least 2 hours. To disguise the bland taste of tofu, I came up with this recipe after many failed experiments. Serve this vegetarian dish with seasoned rice. Slice the tofu into bite-size pieces. Bring the vegetable stock to a boil, adding salt, garlic and thyme. Add the tofu and simmer for 5 to 8 minutes. Remove tofu and drain on paper towels. Sprinkle black pepper onto the tofu, then carefully roll the pieces in jerk sauce and set aside for at least 1 hour. Place the tofu in the oven at low heat for about 3 minutes. Serve with jerk sauce.